Bosch Rexroth develops customised drive and control solutions for a wide range of applications, from oil rigs 100m above sea level to equipment 5,000m below. From the initial planning to commissioning and lifelong service, Bosch Rexroth creates package solutions with certified components for unique offshore projects and series equipment. Bosch Rexroth offers a comprehensive portfolio to the marine and offshore industry that varies from standard components up to engineered-to-order solutions. Within marine and offshore markets, Rexroth is active in shipbuilding, dredging, shipyard equipment and hydrodynamic research. Bosch Rexroth offers the more suitable solution in drive and control technology, whether clients require hydraulic, mechanical and/or electrical drive products and solutions. Products and systems are engineered to perform under severe conditions and to provide reliable power and safe controls for marine and offshore applications. Bosch Rexroth’s lifecycle management support comprises spare part management, field service, repair and overhaul works worldwide. Drive and control technology used on the high seas must always be safe and reliable. Bosch Rexroth meets these requirements throughout its entire portfolio. The company understands different working environments and selects the most appropriate technology for the job by matching the requirements of the client with its industry experience. Bosch Rexroth delivers hydraulic and electric-powered drive and control systems for all kinds of applications. Bosch Rexroth delivers high-quality components, which are certified to the latest industry standards and implement complete drive and control systems. 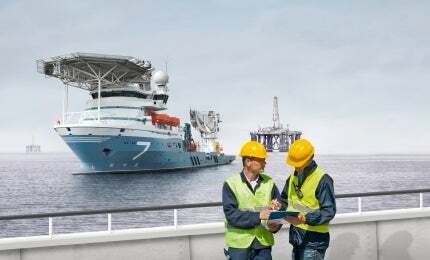 Bosch Rexroth has more than 60 years of experience in the marine and offshore market with applications such as heave compensation, propulsion and steering installations, crane and winch drive solutions, and (de)commissioning projects. The company offers the best solution in drive and control technology with a strong focus on energy efficiency and onboard safety. Projects are carried out in close cooperation with the client, incorporating optimal communication, technical and commercial project management, and application knowledge. Product launch at offshore ONS exhibition, Stavanger. Including Lloyd’s type approval for Maritime & Offshore aggregates of 350kW to 3,000kW.